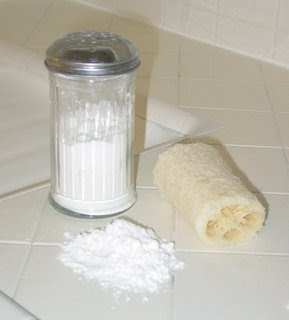 I stopped using commercial household cleaners almost completely a couple of years ago, with the exception of laundry soaps and dish soaps - though now I make our powder dish-machine soap, too. I've done quite a bit of research on it, as I'm something of a germaphobe (thanks, Putty). When I clean, I have to know it's clean. It has to look clean, smell clean, feel clean, and sparkle clean. I have to hear the Voices of the Angels. And I don't like vinegar. So there. I am not above using a little bleach (a tablespoon or two) in a squirt bottle filled with water when things are feeling yucky. It sterilizes. I don't like to do it -- it feels like cheating, and I know it's not good for the earth. But I have lots of white tile, white shirts, and an aversion to mold stains on the bottom of white shower curtains, so I've made peace with it. But most of the time I try to stay on top of the bathrooms and the kitchen, so I don't use it. With that full disclosure, :), here you go. First I'll give you info on the ingredients, so that you can make your choices accordingly. Lemon Juice and Vinegar neutralize substances such as marks from hard water (scale) because they are acidic. Acids also remove dirt from wood and dissolve tarnish and gummy build-up. Lemon is also an effective grease cutter. Baking Soda (sodium bicarbonate) absorbs odors that are in the air, and neutralizes acid-based odors in the water. It can be used as a scouring cleanser, which can be used on bathtubs, sinks, countertops, fiberglass, and ovens. It will neutralize many chemical smells if added to the laundry. Washing Soda (sodium carbonate) is somewhat similar to baking soda, but has a much higher ph. It's a great solvent that releases no harmful fumes. It cleans petroleum oil, wax and lipstick, and cuts grease. It also neutralizes like baking soda does. It's caustic, so they say you should wear gloves when working with it, though I never do am not bothered by it, even though I have somewhat sensitive skin. Natural and eco-friendly dish machine powders contain washing soda. Borax (hydrated sodium borate) is a great multi-purpose household cleaner, though it is mildly toxic. It is also a water conditioner, so if a bit of it is added it to your recipes calling for a bit of soap, it acts as a hard-water softener. It deodorizes whatever it meets, and can be used to clean porcelain and fiberglass, along with most other surfaces, including fine china. It also helps to remove various stains. Do some research on it if you're thinking "absolutely non-toxic", though even essential oils can be deemed "toxic", as they are anti-biotic. Soaps and Detergents are not the same thing. Soaps are made from lye and fat, and react with hard water, causing soap scum. Detergents are made of synthetic materials, specifically designed to not react as soap does. Disinfectants are necessary for cleaning our environment and staying healthy. The EPA recommends a simple soap for this purpose. You can use essential oils added to or in lieu of a natural vegetable (such as castile) soap. All essential oils inhibit the growth of organisms – bacteria and germs- but some are more effective. For antibiotics, use garlic, lavender, myrrh, or tea tree oil. Anti-fungal oils are cinnamon, marjoram, myrrh, savory, tea tree and thyme. Antiseptic oils are bergamot, cajeput, cinnamon, eucalyptus, fir, garlic, juniper, lavender, pine, rose, rosemary, sandalwood, savory, tea tree, and thyme. For antivirals, use bergamot, eucalyptus, garlic, geranium, helichrysum, lemon, tea tree, and thyme. Bactericides are bergamot, cajeput, euclaytus, garlic, juniper, lavender, rosemary, tea tree and thyme. I've taken to using thyme in my dish-washing powder, as the research that I've done shows me that it kills bacteria, staph, ecoli, - is anti-fungal, anti-bacterial, and anti-viral. This is a great recipe for cleaning tile, and it has no acid so it will not deteriorate the grout. I have white tiles and grout in my kitchen that this cleans it beautifully. Also use it for bathtubs, toilets, sinks, and countertops. I recommend adding a few drops of essential oils (I use orange and a couple of drops of spearmint), but you’ll want to make a small enough solution that the oils don’t go to waste, as the soda will eventually absorb the fragrance, and the oils will evaporate. Try orange and peppermint together, or eucalyptus and ylang ylang, grapefruit, tangerine, pine, anything that smells clean to you! You can put the mixture in a cheese shaker or something similar for your ease. 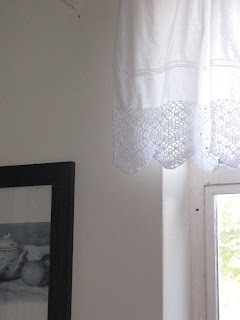 For mold and mildew: use this same recipe, but make a paste to slather on wherever you need it. Leave it for a while, then scrub with a soft brush. If you need a bit more power, try the same thing with just borax. This is my favorite cleaner. I have one bottle filled for the bathroom, and one for the kitchen. They're the same ingredients, just different scents. Orange, grapefruit, and lemon essential oils for the kitchen, and spearmint for the bathroom cleaner. Love, love, love it. I use it on everything! In large a measuring cup put in the borax, and add hot water to it, to dissolve the powder. When it dissolves, add the lemon juice or vinegar. Pour it into your bottle, and add the soap and water. You can used distilled if you prefer, though I run out so fast that I usually use tap water. Shake well. Add oils of your choice for added disinfectant and fragrance. Use more or less ingredients, depending on how many ounces your bottle holds. A great kitchen cleaner, as lemon juice and vinegar are both great grease-cutting agents. This recipe is especially helpful on the stove and the surrounding area. The creator of this formula only uses a tablespoon in each compartment, but I use a bit more than that. I also use my " pre-rinse" cycle before I wash them, as it's not a "dissolve the food off the plate" cleaner. I have hard water, so this recipe is acclimated to that. If you have soft water, cut your citric acid and salt to 1/4 cup each. 30 drops citrus essential oil--lemon, grapefruit, orange, or tangerine. I use about 15 drops of citrus oil and 15 drops of thyme for disinfecting. Shake it well, and done! Outside of the kichen and bath I don't want to use soap, as I don't want a dull film on dressers, the wood in the livingroom, and every where else. So here's my spray for the rest of the house. For the oils, use whatever you prefer. I tend to use "happy home" ones, orange and bergamot for joy, lavender for harmony, pine for prosperity, clary sage for creativity, etc. I spray what can be sprayed, and what can't I just wipe with the dampened rag. Sometimes (like for the bathroom, or when we've had colds or the flu) the big guns are necessary. When that's the case, try this! After washing out a commercial carpet fresh container, fill it up with baking soda, so you know exactly how much to make. Pour the soda back into a bowl, and mix it with either herbs that you have crushed in a blender, or several drops of your favorite essential oils. Orange and grapefruit make a lovely blend, but by all means experiment! Let the baking soda set and get stomped on, it will absorb odors that are in your carpets. After vacuuming, you can even add a little more to leave on for an extra clean smell. Add vinegar or lemon juice to the rinse compartment in the dishwasher. Both are acidic and neutralize alkaline substance such as hard water, so your dishes will come out clean and shiny. Oh Stephanie--you know I love your potions! I've been using them for almost two years now & can't iagine going back to commercial cleaners!! Thanks for sharing this post again! I have loved your potions since the very first time I ever made them! They are simply divine! Thank you, Stephanie. I just bookmarked this and am excited to brew up some cleaning potions! I use mostly vinegar/water mixture, 'cause it's cheap and foolproof, but my family does complain. :) I look forward to trying your kinder, lovelier solutions.